As I’m rereading The Lunar Chronicles in preparation for Winter, I’m taking a closer look at each of the books. 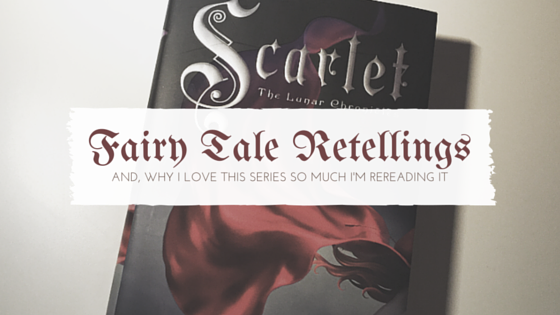 I studied fairy tales in college, and I’ve always been interested in reinterpretations and retellings of the stories. I love that this series has a lot of science fiction elements woven in with the traditional magic elements often found in fairy tales. This second one rates just a slight bit higher than the first because there’s more action, there’s a bit more world development, and a lot more character development. I won’t write out many spoilers, so I’ll touch on things I liked and didn’t like. Out of the new characters introduced, I really like Thorne. He reminds me of a younger, more rash Han Solo. 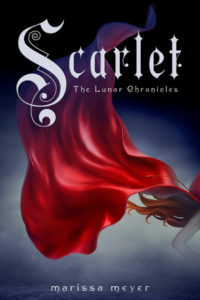 Scarlet is the sort of heroine I want to see more of in books marketed toward younger readers because she’s quite open-minded about a lot of things, especially with regards to Wolf. Something that I found a little unbelievable was everyone’s utter blindness to Cinder’s true identity. The obliviousness left in that blind wake made for sort of clunky storytelling, so if anything could be remedied about this series would to either make a bigger deal of Cinder’s identity or withhold it until a more climactic reveal. Because honestly, why else would Levana be so adamant about killing Cinder? Meyer’s writing and characterizations are stronger in this second novel of the series, and it ends with a great lead-in to Cress.